While there are some (many) times that I suspect my gut reactions of being contrary simply for the same of being contrary, at other times my contrariness seems to lead me in the right direction. I've been writing about lesser-known contemporaries of Charles Frederick Worth since 2014 (see my first post on the subject, regarding Emile Pingat) in an effort to promote the knowledge that Worth wasn't literally the whole of the Parisian fashion world in the second half of the 19th century. But it wasn't until a recent question on the AskHistorians subreddit about Worth's innovations in the industry that I began to really reconsider his accepted position as a revolutionary who elevated the simple business of dressmaking into the completely new field of haute couture. The caption reads: "Coiffure executed by M Smal, palais royal, Montpensier gallery, 7. Flowers from M Chaget, rue Richelieu, 81. Gown of silk lace from Mns Violard, rue Choiseul. Rice-straw hat from Mns Lavand Brandry, rue Richelieu. Velvet spencer made by Mme Desertine, end of Montmartre, 9." This trend continued through the 1840s and 1850s, sometimes even specifying the perfumes the imaginary women were wearing, their shoemakers, etc. Periodicals described dresses from specific dressmakers in great detail as well - Les Modes Parisiennes let women know that Mme Olmer "makes a pretty model of this type, thus composed: a gown of silk in two shades, green and purple or blue and black, with brandebourgs in the two shades of the silk crossing each other and diminishing in width around the top of the skirt; the bodice and the sleeves have a trim which matches that of the petticoat." And Mme Camille made a gown for Queen Isabella of Spain with a style of revers she claimed as her own invention, as described in Graham's Magazine in 1856. It's entirely possible that these plates and descriptions were drawn from gowns that dressmakers had made with significant input from customers, or that they were simply well-drawn illustrations that dressmakers paid to have their names put under. But I don't think it's possible to get away from the fact that these are designs advertised with the implication (or more than that, in the case of the textual descriptions) that a woman who wanted that gown could have it made by that dressmaker. 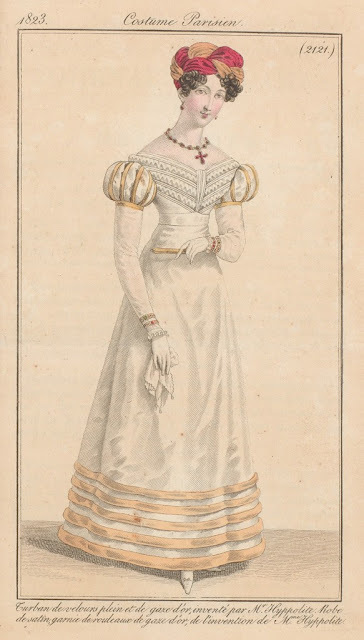 Some top dressmakers, such as Mme Palmyre, were known to give multiple customers the same gown ("It is saddening to find three gowns at a ball whose appearance matches your own, it gives you the vapors," said one writer on the subject) - a phenomenon that could only occur if dressmakers were given design latitude, rather than every dress being a joint effort. 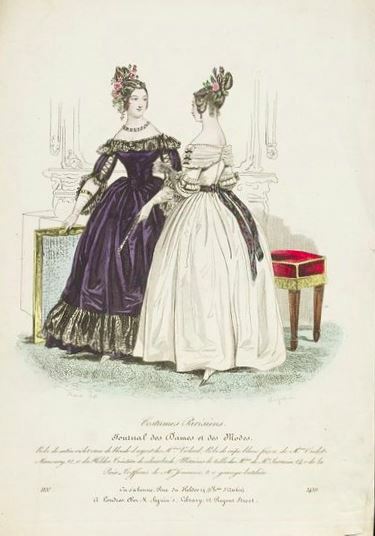 Looking at some of the establishments mentioned in fashion plates is telling. Magasin Violard was given ecstatic praise in Le Follet in 1844: "no maker is superior to Violard in the happy disposition of design, none equal it in execution where a feeling of true elegance without defect is noticed". (This is followed by praise of Mme Ferrière-Pennona and Mme Thiéry, dressmakers.) The December 1856 issue of the Moniteur des Modes described Pauline Conter, head of the workrooms at Maison Lhopiteau, as "an innovator par excellence"; the house offered gowns and ready-made novelties. This is something I've addressed in the past with Chanel - the fashion press nearly always celebrated the dressmakers and designers they mentioned, so it's important to take their effusive praise and insistence that one person is the best at a certain style of dress as just part of the normal rhetoric around fashion, even if the fashion house, like Worth, is now well-known. It has long and justly been a subject of complaint in England, that men are rapidly encroaching on the employments of women. Shopmen are now everywhere substituted for shopwomen, under the curious plea that the ladies prefer being served by young men. The same fatal system is silently operating in France. From the Physiology of the Tailor, we learn that men have taken to making shirts; and the author of the Physiology of the Grisette assures us that, within the last fifteen months, male dressmakers (modistes) have made fearful advances; though Victorine, Palmyre, Oudot-Manoury, and a few others, are still unshaken in their supremacy. However, as far as I can tell, he was the first male dressmaker to reach the top of the Parisian fashion world within the mid-century context: as Andrew Schroeder points out below in the comments, Louis Hippolyte LeRoy was making and trimming gowns for royalty and the aristocracy in the early 19th century. In the interest of full disclosure: I had thought that one of these forgotten dressmakers led to another interesting wrinkle in the standard Worth narrative. 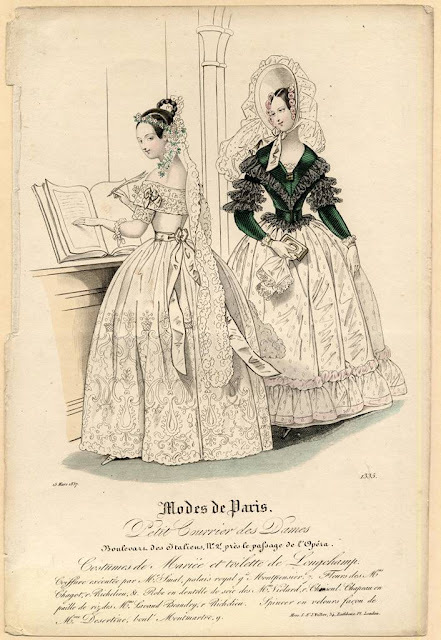 Mme Oudot-Manoury's name appears in many similar lists of the top Parisian dressmakers, and on quite a few fashion plates from the late 1830s and 1840s. (A piece in Blackwood's Lady's Magazine in 1837 even attributes the (unfortunate) trend of reusing 18th century silk gowns to her.) Called "daring" and "inventive", she made several gowns for Sarah Polk, first lady. Several months ago, someone posted a gown from the 1840s to Facebook with some discussion about the maker's stamp on the lining or waistband. I know this for a fact, but it's not to be found anywhere. At one point I was sure that a particular 1847 dress made by Oudot-Manoury for Sarah Polk was the one with a label ... but an email from the curator proved that this was not the case. So there are no pre-Worth gown labels to show. But even apart from that - labels in hats can be found as far back as the 18th century, and shoes almost as far. While it did not become standard practice to label dresses until the mid-19th century, the concept of labeling an item with the maker's name and address was not an invention of that period. Worth was clever to adapt this practice to dressmaking, but it is not his concept. Dressmakers before Worth also had their own showrooms where customers visited. Numerous sources describe such establishments before Worth & Bobergh opened: the main area of the dressmaker's shop would be decorated to impress the client and could hold the "confections" she might offer - ready-made items like caps, bonnets, chemisettes, fichus, cloaks, etc. - and Mme Oudot-Manoury's was even said to be "a small chamber full of the most lovely robes". Women who wanted to engage the dressmaker would come there in order to discuss what they were looking for in terms of cut and fabric, and while the woman in the linked dialogue was highly opinionated regarding her tastes, any woman could leave the trimming up to her dressmaker, if she wished. However, it was standard practice for fittings to be done at the customer's home by one of the dressmaker's assistants, at least in the higher levels of society, while Worth demanded that his clients continue to come to his salon. While Worth's reputation for artistry was certainly not unearned, it must be looked at within its proper context. Dressmakers before him were not all obscure women with no power - they had national and sometimes international renown, and their names were recognized as quality brands, commanding high prices and devoted followings. Like Chanel's, his name has benefited through the years from his contemporaries and predecessors simply being forgotten. Re: "he was the first male dressmaker to reach the top of the Parisian fashion world." - Louis Hippolyte Leroy was the marchande de mode for Napoleon and his family, and from the little research I've done, he achieved a position during the First Empire similar to Rose Bertin and Worth. This is a good point. My understanding of LeRoy has been that he was, as you say, a marchande des modes - but that's not the same thing as a dressmaker, the marchande's business being more in the line of trimmings and accessories. But looking at his account book shows that while he was largely providing fournitures, belts, guimpes, etc. he was doing some dressmaking after all! Thank you for prodding me - I'll have to alter the wording to reflect the context. I wonder, what's the difference between a male dressmaker and a male women's tailor? In countries with a German type guild tradition, male tailors never stopped making dresses for women. They continued to do it throughout the 18th century and into the 19th. Some even specialized in women's clothes only; e.g. J.S. Bernhardt (whose 1810-1811 books on pattern cutting contain the now famous "short stays") was a women's tailor. (Swedish fashion historian Pernilla Rasmussen has written about this, including an article in English in the anthology "Fashionable Encounters".) For another example, I happen to have a book about Swedish coronation clothes, and each of the 19th century Swedish queens' coronation gowns was made by a Swedish male tailor. I think it's possible that tailors in the German tradition continued to sew high-status gowns to some degree throughout the 19th century; female dressmakers were only just emerging as a profession at the beginning of the 19th century. You see the same thing in France (I'm fairly sure in Great Britain as well, but now I'm doubting my memory) - when women took over dressmaking, tailors held onto court dressmaking. If I recall correctly, that persisted at least to Garsault's time.